This item is a custom made underskirt! 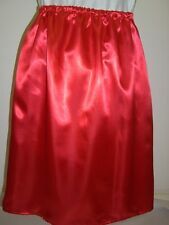 If you need the skirt in a hurry just let us know and we will do our best to get it with you sooner.The underskirt is in a soft satin,and can be made in any colour, and any size and length. Short Sleeve Sheer Lace Chemise and Thong Set. AGENT PROVOCATEUR. CELESTE Short Kimono – Size SM (UK 6-10). LIMITED EDITION. ALONG THE TOP OF THE FRILLY HEMLINE. THIS IS A PRETTY HALF SLIP /PETTICOAT. ORGANZA BOWS. IN A RED ORGANZA FABRIC.